Scotland is fortunate to have many fine salmon fishing rivers but none more so than the mighty River Tay. This big Scottish salmon river starts it journey high up on the slopes of Ben Lui in the West and continues its 100 mile journey down through some of Scotland's most beautiful landscapes until it reaches the North Sea at Dundee in the East. The River Tay benefits from a run of salmon in the Spring, Summer & Autumn during its long salmon fishing season from 15th January to the 15th of October. The Autumn component has always been a big run of salmon but hindered in recent decades by the traditional early closing date of 15th October when these fish are now only just starting to appear in the river these days. In the 70's I recall snapping ice of my rod rings on the Tay during September which won't occur these days until late November or even December such is Mother Nature's rightful disrespect for our synthetic monthly calendar expectations. Our salmon also only respond to river levels & water temperature and again not our 'man made' numbered week expectations. I recall even 10 years ago quickly catching 5 salmon on the fly during November of which most were fresh run specimens while fishing through the closed season for hatchery brood stock. Management & common sense unfortunately don't go hand in hand so the old 15 October River Tay seasonal end date still stands which is probably best for the salmon but not for sport or the local Perthshire economy. Our inability to adjust salmon fishing dates as climate change naturally moves ahead is just another example of the often 'detached' approach to Scottish salmon fishing management that has hindered the amazing Scottish salmon fishing asset. Right now 15 February through to 15 November would be about perfect for the main River Tay for various good conservational & economically beneficial reasons. The Spring salmon fishing on the Tay on the middle river has been excellent in recent years which is primarily due to the 'catch & release' initiative that a few of us pressured the river management into adopting back in 2007. Many salmon anglers from all over the world ascend on the Tay between March & June such is this fabulous river's growing Spring salmon fishing reputation. Even this year the Tay is again fishing well such is its consistency of Spring run fish between February and mid April. I've no doubt the following 6 weeks will be just as good or better for Spring fishing too. Part of the reason the Tay does so well for catches at any time of the year is due to its sheer size and depth and its vast loch loch fed headwater catchment. This composition ensure's steady water levels which encourages salmon to run at all times where on smaller Scottish rivers this would not be possible. This makes the River Tay a great venue especially if you've only got a day to fish due to a tight work schedule or busy holiday itinerary. This spectacular salmon weighed in at 22lbs and was captured on the Dunkeld House salmon fishing beat last Saturday which was one of many caught recently on this middle Tay salmon beat. 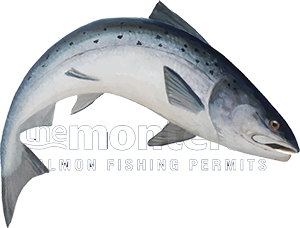 Catching salmon in the Spring is also extra special due to the perfect condition of these Spring fish coupled with their exceptional cold water fighting abilities. The allure of Spring salmon fishing in Scotland is on the increase so booking early is always advantageous as the best Spring Tay fishing venues have restricted daily salmon fishing access. My professional advice would be to take March & April as seriously as you know how on the Tay as that's when the best opportunity to connect with a 'real' heavyweight Tay springer exists!